There was time to do some sightseeing when Junk and Boom was down in Ozland. It has been quite a few years since we have been to Mandurah and with the rare sunny winter’s day, thought a day out at the marina will do the spirit some good. 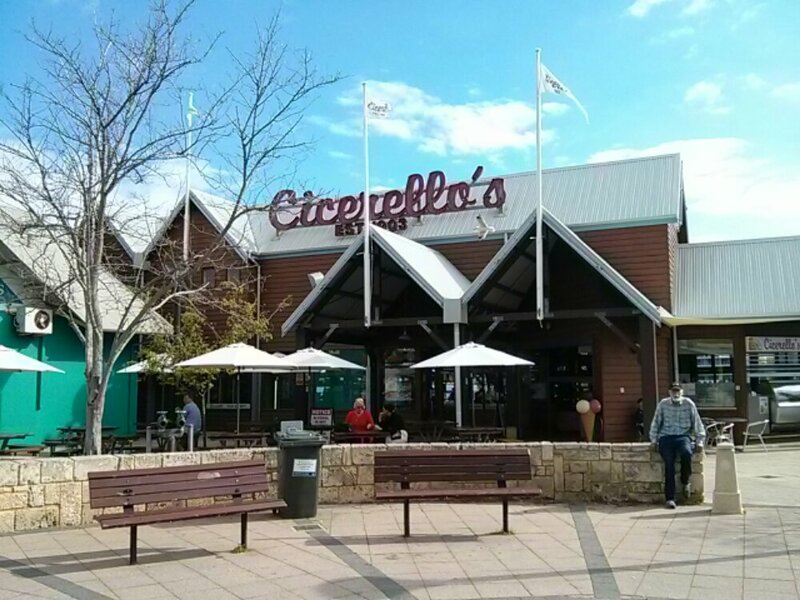 After checking out the marina, property prices and the leisure boats on sales, Boom felt peckish and wanted some squid from Cicerello’s, supposedly WA’s No1 Fish ‘N Chip restaurant. 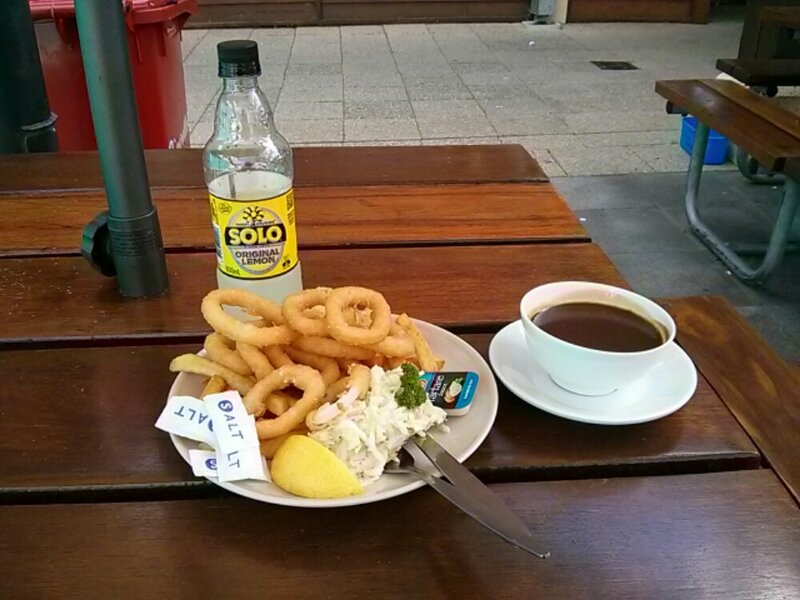 Not feeling hungry and knowing the portion size in Oz, suggested to Boom that if he were to get an order of squid with chips and some gravy, that should be enough for the 2 of us. 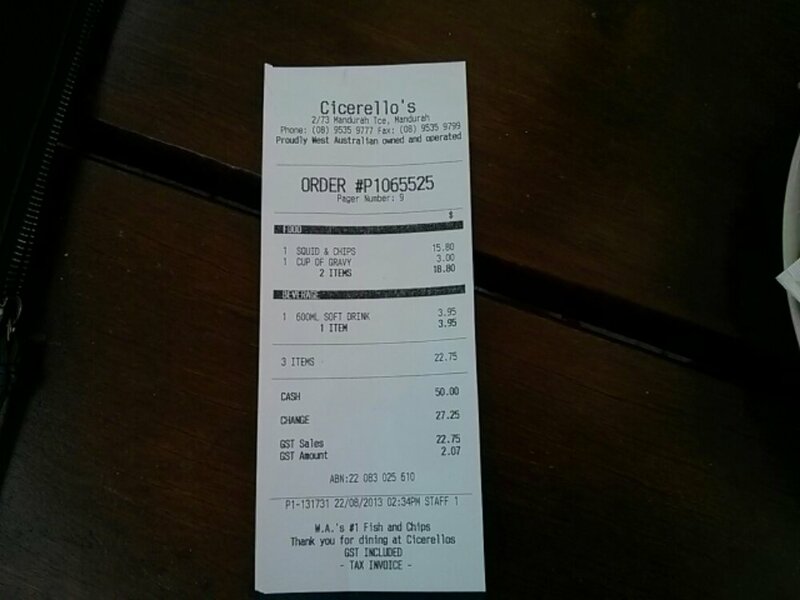 Eating out in Oz sure is not cheap! 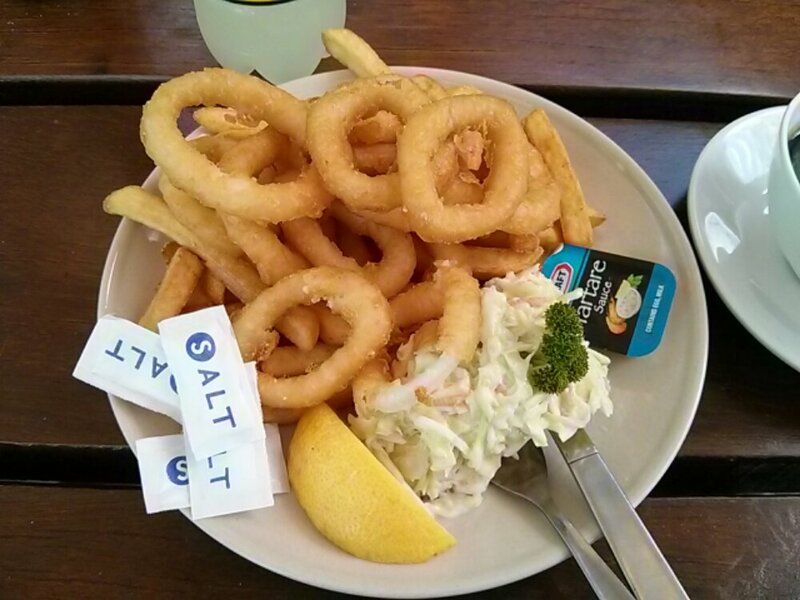 Perhaps I did not take the currency exchange into consideration but a portion of Squid and Chips for AUD$15.80? They also get you on the drinks here. A bottle of Solo for close to AUD$4! Then again, Boom paid so I can’t really complain. 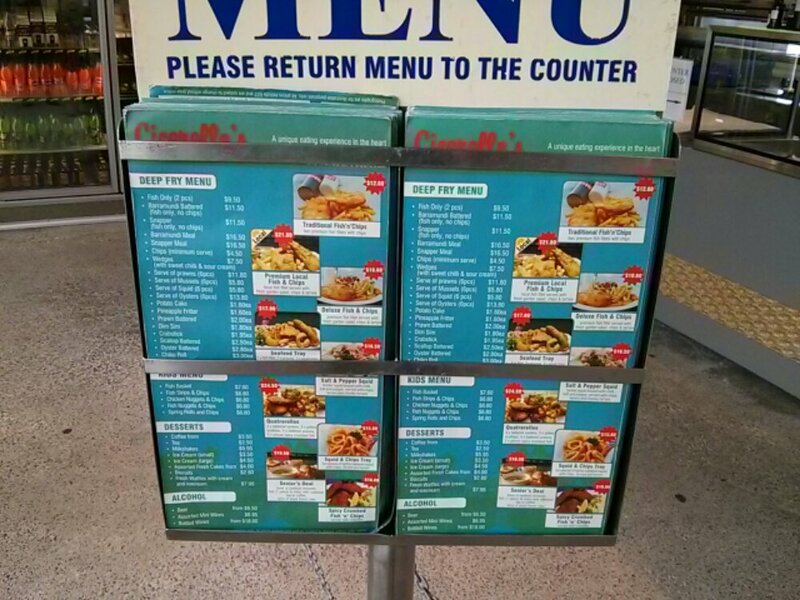 Pics of the menu so you can see the price range. As you can see, I was right about the portion. There were 10 squid rings in total but they were not great for the batter tend to fall off the rings when you bite them. Was not expecting the portion of coleslaw as it was not mentioned on the menu. Glad it was included as the coleslaw was fresh and crunchy with bits of red onion which we both loved. The highlight of this snack was the gravy! Rich, beefy and totally slurpable! Definitely not of the Bisto quality, this is truly good stuff! Even after dunking each and every chip we had as well as the squid rings in the gravy, we were left with close to half a bowl. 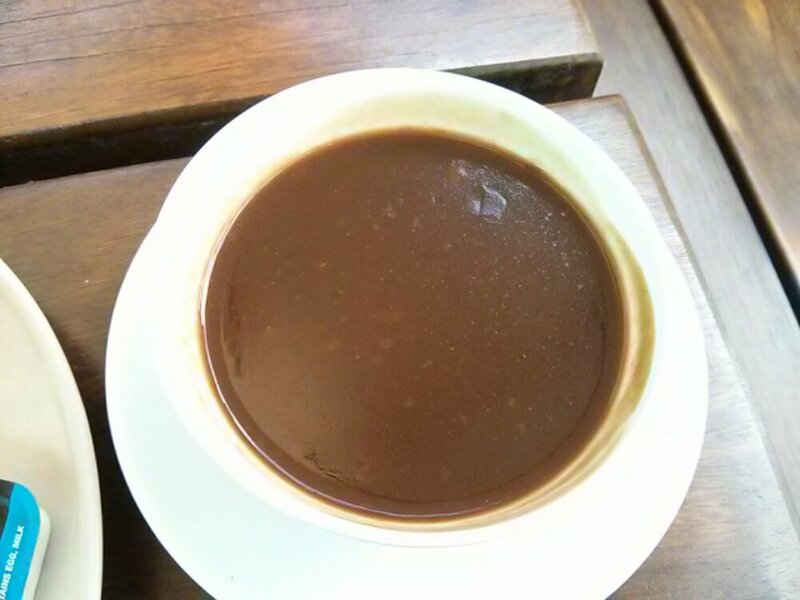 Boom suggested I drink the gravy from the bowl. 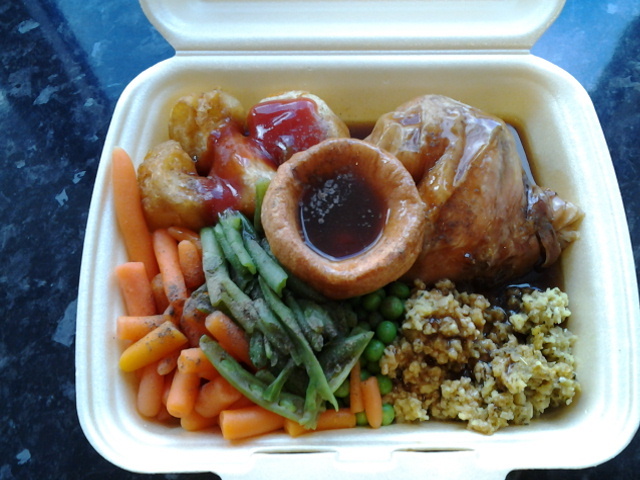 I thought better but wished instead that I have asked for a takeaway container to doggy bag the remaining gravy! One of my biggest past time on weekends is cooking. I’m always looking out for inspiration of new things to cook be it recipe from newspaper, supermarket freebie magazines or fellow food blogs. Seeing it’s Burns Night last Friday and I have a wee bottle of Scottish Whiskey hanging around, decided to grab some proper haggis from Borough Market and give Haggies, Neeps and Tatties a go. Wanted to get haggies from The Ginger Pig but they were sold out by lunch time. 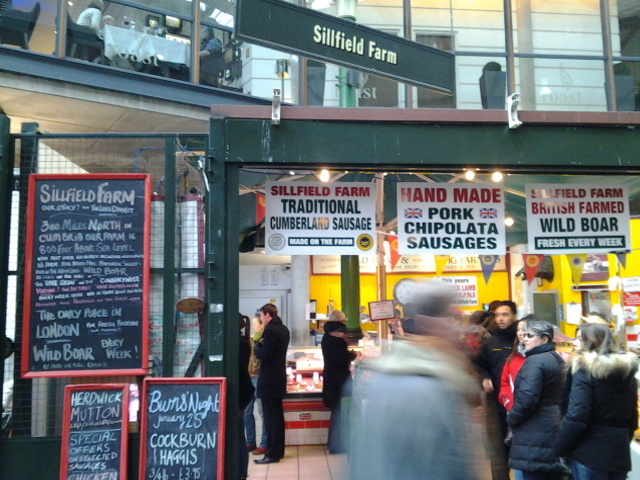 Had to resort to Plan B and got it from Sillfield Farm next door instead. The haggies supposedly comes in 2 sizes but they ran out of the big one so I had to get 2 small 3/4 pound ones instead. 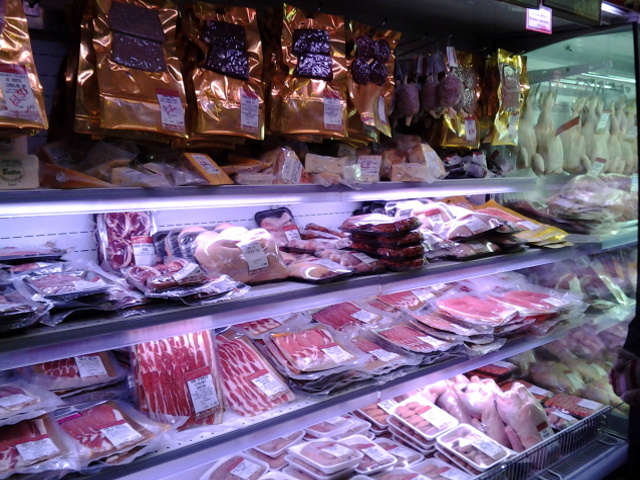 They were £3.95 each, not cheap considering it’s made from offal. For those of you who are curious, haggis is a traditional Scottish dish made from sheep’s pluck which is it’s heart, liver and lung. The cooked and minced pluck is mixed with onion, oats and various herbs and spices and stuffed in a casing so it’s something like a sausage. The “parcel” is boiled but unlike sausage, you don’t eat the casing. 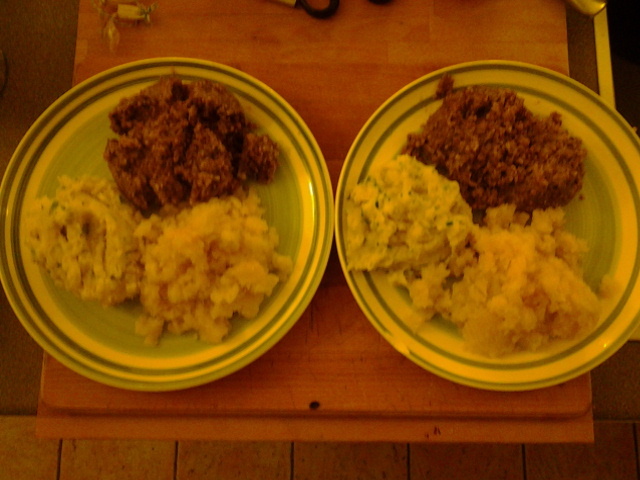 The classic accompaniment to haggis is neeps and tatties. Mashed turnip and swede and mashed potatoes. 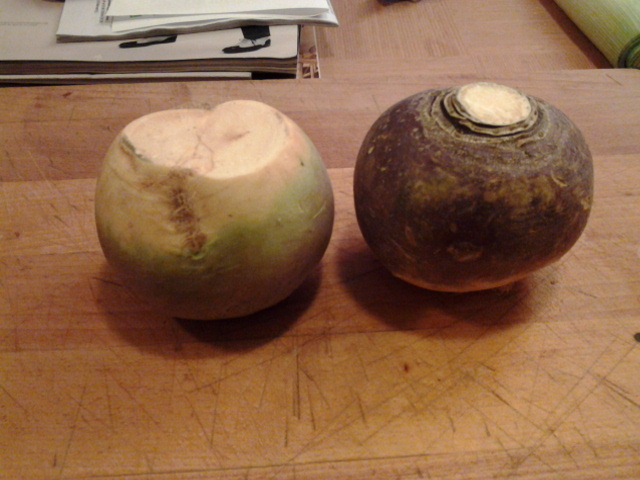 After reading several recipes from the interweb, I’m still not sure whether neeps refers to turnips or swede. Decided to go with swede since I thought the slight sweetness will go well with the rest of dish. Also made a basic Bisto gravy but added some leeks to it. I know the picture don’t look great, the lousy lighting at Chez Boom makes everything looks yellow (Junk included, well she is already yellow afterall). The pile with the green bits is the mashed potatoes, the green bits are chives. This is not the first time I have tried haggis but have to agree with Boom that this is best one we have both tried. 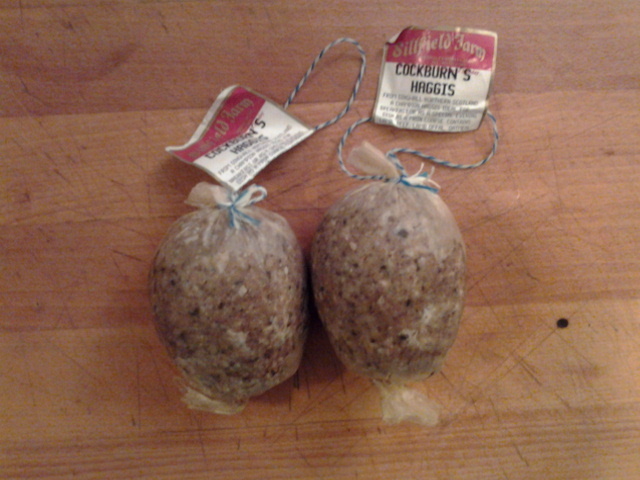 The haggis is not dry at all and is rich and wholesome, no trace of offal taste at all. Combined with the creamy mash and slightly sweet mashed swede, it was the perfect meal for a cold winter night. 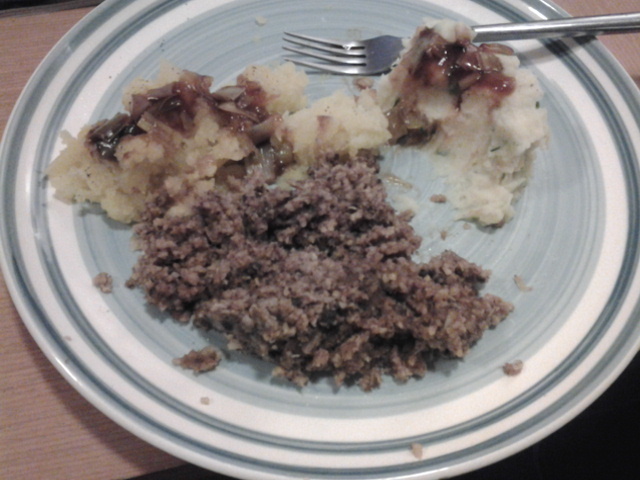 Boom liked adding whiskey to the haggis while I prefer it without. Somehow the whiskey was too harsh for my taste. In all, really enjoyed it. You must be thinking Junk is out of her mind! Why is she having dinner for lunch? Well, I can frankly admit that I can eat anything anytime of the day and I will even go as far as having curry for breakfast! 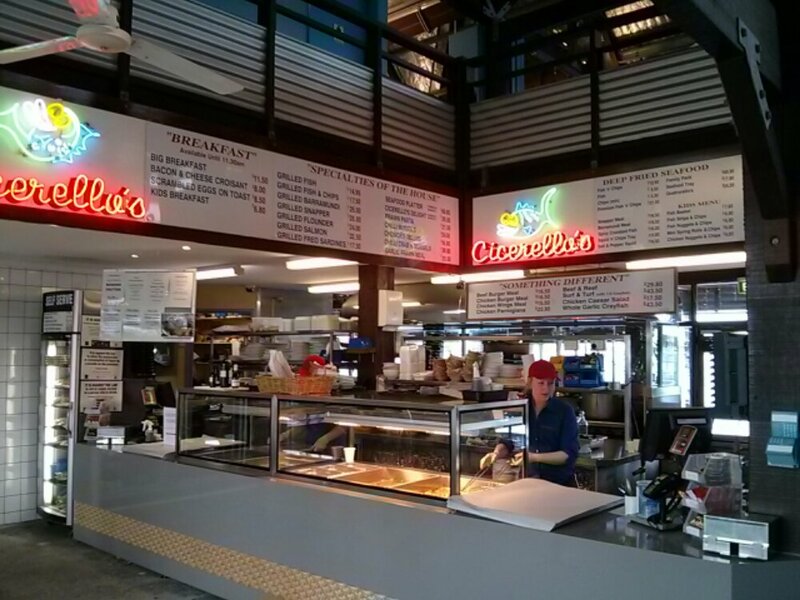 Seriously though, today’s lunch is from a funny little place near my Canary Wharf and they have a limted menu. 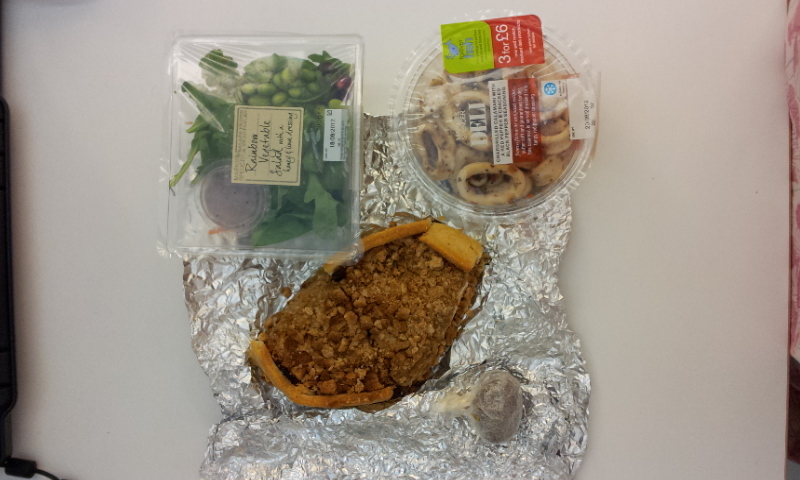 I was stuck between having their All Day Breakfast or one of their roast dinners for lunch, I went for dinner. Dockland Diner is a typical greasy spoon which I believe might be a dying breed nowadays what with takeovers by fast food and and designer cafe chains. The joint is ran by a troop of females (I counted 5 in total) and everyone seems to know everyone which can be a tad intimidating for newbies like me. 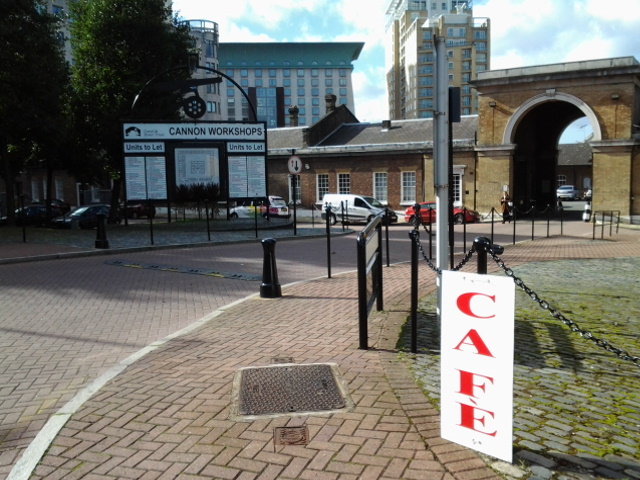 The place is rather hard to spot as it does not have the usual frontage of a food outlet with just a plain plastic sign evidence of it’s existence. 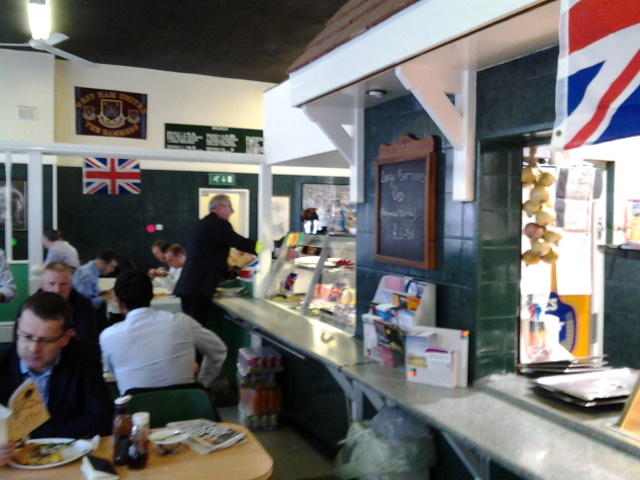 I don’t think I spotted any paper menus apart from the couple of blackboards along the interior walls. 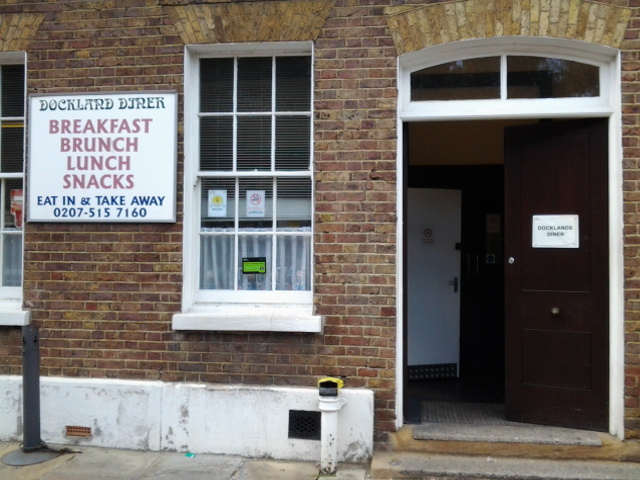 From what I gather, they serve the typical breakfast, filled jacket potato, the token lasagne, some pies and roast dinners with a choice of protein. I wanted to have the pork roast but they were freshly out and so was the lamb, no choice but roast chook it shall be. For £6, I think it’s not a bad deal, especially when the lady manning the cash register did not charge me for the ginger beer which I added to my order. To be honest, I don’t really know how a roast dinner should taste like. 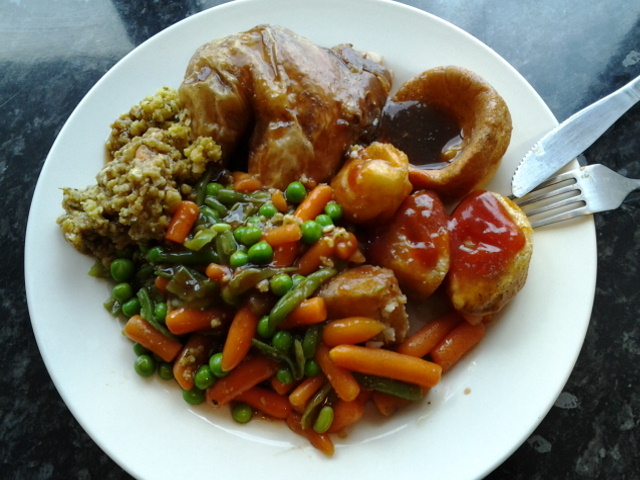 The chicken was roasted with perhaps just a slight seasoning of salt and on the dry side, the single Yorkshire pudding and roast potatoes taste like Aunt Bessie’s, the carrots, peas and runner beans were probably frozen and I can tell the gravy is of the Bisto variety. This roast dinner makes Crown Carvery taste like gourmet, even Furry makes a better roast! Having said that, I think the ambiance is rather cool. Real, loud, edgy, east end. I might give their breakfast a try next time before discounting them totally.